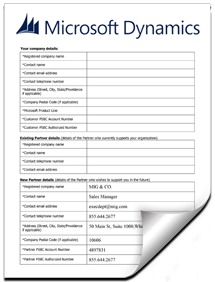 When you purchase Microsoft Dynamics GP or Dynamics SL, you have the ability to designate a Microsoft Partner to be connected to your account as a Partner of Record (POR). Choosing the right Partner of Record can help you significantly reduce costs and facilitate a smooth and seamless transition to the cloud. Download and fill out the Change of Partner form. Be sure to sign and date the completed form. After we receive your completed Change of Partner form, we will submit it to Microsoft for processing. 5 Reasons to Choose MIG & Co.
Save money on your annual subscription costs through recommendations designed to help you optimize your Dynamics configuration. Adding a Partner of Record to your Microsoft Dynamics GP or Dynamics SL subscription costs you absolutely nothing and does not in any way affect the support and services that you receive from Microsoft. There is no minimum time commitment requirement and designating a Partner of Record does not provide your partner with access to your organization’s business data. Ready to learn How Microsoft Dynamics can help your business?